August Albert Zimmermann (born at Zittau in Saxony September 20, 1808 - died Munich, October 18, 1888) was a German painter. He was the brother of painters Max, Richard and Robert Zimmermann, and served as Max's teacher. His father was a city music director. Albert himself played music in his younger years. He was primarily self-taught as a painter, but did study at the Academies in Dresden and Munich. In 1857 he was appointed by the Austrian government to a professorship at the Milan Academy and from 1860 to 1871 he taught at the Academy in Vienna. The main topics of his art were the Alps and Italy. He painted mainly landscapes in a naturalistic style. 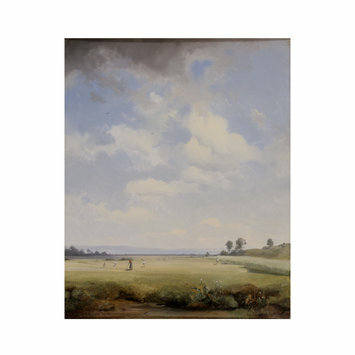 Physical description: A painting with figures haymaking in an extensive landscape, with a towering sky above. Zimmermann had a brilliant technique and excelled at light effects and spontaneous effects of nature. Albert Zimmermann was one of the most important German landscape painters of the 19th century. Friedrich Pecht described him as a “true Protean” and wrote of him that “Today Zimmerman created highly stylised landscapes in the style of Koch, tomorrow in the style of Rottmann, and the day after in the naturalist style of Calame....Amongst his formidably numerous, naturalistic creations, it is often the small paintings which are true pearls, delicate and with a fine sense of nature...”.